The new version of NirLauncher package (1.10.x) provides to ability to edit the software groups and shortcuts directly inside the NirLauncher application, which is much easier than editing the package file (.nlp) in a text editor. However, this feature is still in Beta, and there are some things that you cannot do with it. 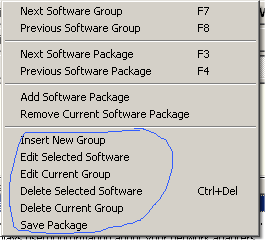 For example: you cannot change the order of software groups (tabs) and they’ll simply appear in the order that you added them. In order to enter into edit mode, go to the Options menu, and check the ‘Edit Mode’ menu item. After you switched to edit mode, some editing menu items under the ‘Launcher’ menu will be enabled. In order to add new applications, simply select the desired software group, and then drag one or more .exe files from Explorer into the window of NirLauncher. The .exe files must be located under the folder/subfolder of the package file, so the path of the .exe file will be relative. You can also use the other options under the Launcher menu to add/edit/remove software groups and to delete unwanted software shortcuts. Finally, after making your changes, you can use the ‘Save Package’ option in order to save the changes into the package file. Be aware that if you switch into another package when you in edit mode, your changes will be lost. In addition to this editing feature, I also made some performances improvement, especially when loading a software group in the second time. For example: if you click the ‘All Utilities’ tab, and then click another tab, and then click the ‘All Utilities’ tab again. the second ‘All Utilities’ loading process will be much faster. 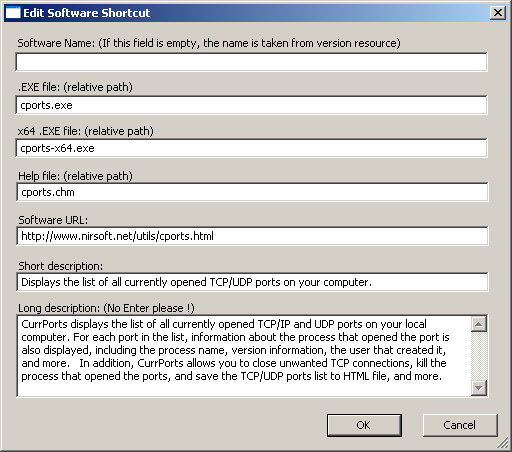 This entry was posted by NirSoft on September 5, 2010 at 1:23 am under Utilities Update. You can skip to the end and leave a response. Pinging is currently not allowed. Follow any responses to this entry through the RSS 2.0 feed. Only one feature has missing – autoupdate out off date programs or update checker. Because there are pain when need to update programs manualy. Very Good, this feature is good. Thanks for such helpful softwares. but, Devastator is right update feature also needed please add that. again THANKS. But I came across one bug: the helpfile-path in not regarded anymore at all. What ever I tried wouldn’t work and the helpfiles will only / always be listed if they accompany the exe (indepentend of a given path). Playing around with the editmode I soon found that it’s very unhandy that the mode-switch is not in the same menu as the edit-features. It’s no major concern still it tends to unease or confusion. btw: ‘autoupdate…’ – I wouldn’t be happy about it as it might corrupt the peaceful nondemanding offline usage. As a (de-) selectable option I wouldn’t bother. You need to implement any kinda of cache, the listing is veryyyyyyy slow somentimes. Some way of creating variables for things like the launch path, or launching the app with the load directory as current ( UnknownDevices can launch from the directory, but not through NirLauncher). Drag and drop to the desktop (so you can work on various problems). This allows, eg dropping utilities into the start menu. I use it as a kind of portable app for all of my odds and ends as well. thank for your work, your programs are really useful ! Fix the broken help file parameter. Add a “View – Rebuild” menu item – It is very hard to get manually edited changes to load (refreshing and reopening the app doesn’t always work). Sometimes, the only way is to delete and reattach a package. Set the console window name to the name of the utility. Great App Launcher and Utilities! suggest the ability to add a new “package” – “favorites” into which utilities can be copied from the other packages. I would find this useful for those utilities that I used fairly frequently. Fantastic work – thanks so much! “This package file allows you to easily add 4 portable utilities of Piriform: CCleaner, Defraggler, Recuva, Speccy. Problem is the 4 zips if extracted all to the same folder have duplicate file names, but these are ‘not’ duplicate files. If I extract each one to a different folder the piriform.nlp of course doesn’t work for them.